A while back, I took it into my head that I should challenge my taste buds by expanding my liquor collection. Over the years, I had fallen into a boring vodka sour / margarita / cheap American beer routine. As a former bartender, I was ashamed of myself. When I got to the liquor store, I knew I wanted to avoid stunt drinks. I have little patience for ridiculously high-proof booze. I don’t want to hide the flavor of a good spirit under cloying fruit flavors. And I don’t feel the need to blend anything. When I came to the bourbon aisle, my little writer’s heart went ka-thump. Yes, I thought, bourbon. Elegant. Stately. Classic. Featured in any number of great Southern Gothics. I discussed brands and quality with the owner of the shop, and came away with a mid-priced bottle and strict instructions to drink it straight, or – if absolutely necessary – over the rocks. A few days later I gave it a go. A nasty liquor-shiver seized me at the first taste. My palate just can’t handle that much … booziness. I filled the glass to the rim with ice and waited for much of it to melt. Once the water / bourbon ration was about even, I could drink it, but I didn’t much like it. As I sipped, I realized that there were some interesting, even pleasant, notes of flavor under all that alcohol. It was somehow autumny. There was a dry edge, almost like woodsmoke. And there was a complex kind of sweetness that I couldn’t immediately identify. When I tasted again, trying to isolate that almost familiar flavor, I was reminded of honey. I jumped up and took my drink to the kitchen, intent on intensifying that note. I promptly learned that honey does not readily dissolve in a cold mixture. I stirred and stirred until the flavors blended. It was much improved, and I was able to finish it, but it was still missing something. Tonight, as I was putting away some spices I’d used to make dinner, I spied the bottle of aromatic bitters on my pantry shelf. I decided to go after the bourbon again. Stir until honey is melted. When I settled in to write this post (with my newly invented cocktail at my side) I idly googled “bourbon honey bitters”. Do you already know the punchline to this? Still, the structure is mostly in place, and I am pretty proud of how I got there. PS: Be assured that my mixologist’s memories faded from my mind long ago. If this was a case of remembering a recipe I once knew, it was entirely unconscious. It’s been a busy weekend. 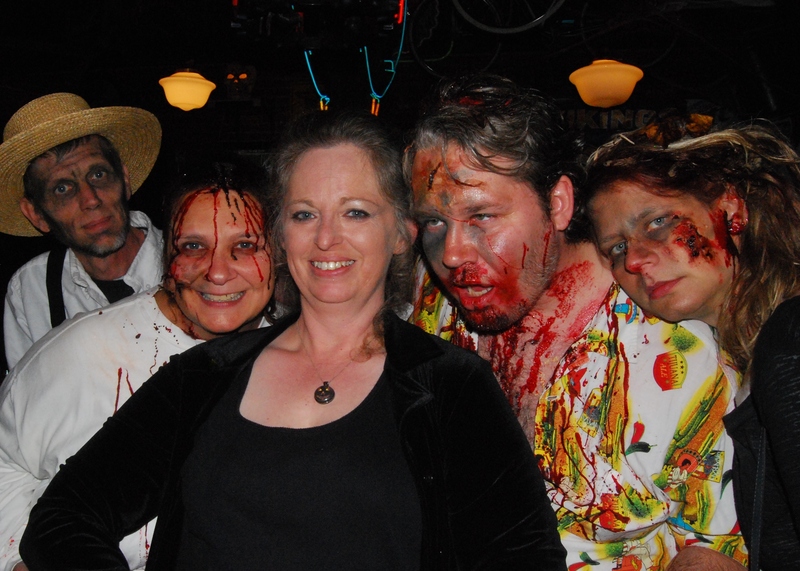 The Anoka Walking Dead Crawl was great fun and there will photographs later this week. Right now, I’m going to go enjoy my old-fashioned (variation) while soaking in a hot bath. ‘Night all. My friend, had we but known, I would have steered you in that direction from the get-go. Bourbon and I are quite close, especially with the biting frosts of fall upon us! This was a fun way to “discover” a cocktail though. And, yes, I agree that bourbon lends itself to chilly weather. I’m going to try a hot toddy next. Do you have a favorite method for that one? I’ve been looking for something other than beer to get me through long nights at my keyboard. I’ll definitely give this a try. I love a good gin and tonic, but it’s amazing how difficult something so simple can be to make. Ooh. Gin. There’s another one I know as a tender, not a taster. It smells like juniper berries, right? I might have a bottle of that in the back of the cupboard. And, yes, that’s the truth of a “simple” cocktail recipe. So easy to burn it or water it down too much. Reminds me of the reactions I had when I first started making my own traditional version of Martha Stewart’s egg nog for New Years Eve. I had to cut the bourbon, cognac (I’d never had either of those before), and rum IN HALF!! And I think I double the milk or cream to make up for it. Even then it’s really strong. I’d have to work really hard at enjoying straight liquor. Ick. But I’ve mastered it and have loved my egg nog for 5 years now. I think the bitters are crucial. And it’s VERY much a sipping drink. Last night,when I decided to turn in, I picked up the glass I’d been nursing all evening and drained the last bit all at once. Got the shivers again. Will you be posting the recipe around Christmas time? I’ve never had egg nog in any form. Not even an ice cream. Which is weird, because I love custard, and that’s pretty much the same ingredients, right? I’m sure it’s similar. Martha used to always have it searchable on her website. Thats a good idea to share it. I’m telling you though, she must be a big boozer… I cut it in half or more and it’s still super strong. 🙂 You have to prepare the egg part ahead of time, separating them, adding sugar and stuff, chilling. Then you add cognac, rum, bourbon, milk and cream, whipped up egg whites, then adding homemade whipped cream dollops on top (I add tons of sugar to the cream.) Then sprinkle nutmeg. I’m sure I’m missing something. I’m not crazy about drinking liquor straight, and am usually too busy scrunching up my face to notice hints of woodsmoke and honey. But man, add some sour mix, and I’m in my happy place! But that’s a cold drink! I do remember making (and loving the taste of) Brandy Alexanders though. We were not allowed to use any kind of blender – just a butter knife and a metal shaker cup. Yaaaaay! I think I’ve had this trophy before. Who did I take it from this time? Hunter and Mark tend to go back and forth, but you’ve pulled ahead by 5-6 now. It’s not too cold when I make it. And it doesn’t have ice. The brandy and chocolate liquor warms it up. It’s not too far from an egg nog kind of thing. And, btw, the recipes I’m finding sound delightful! Guess what I’ll be trying tonight. We’re such bad influences on each other. The ice cream version sounds delicious. When you try it, I think you’ll agree… winter beverage. It’s a taste thing for me. That was a fantastic image, Mark. These were itty-bitty, sips, otherwise I’d have been scrunching too. I have no idea why I’ve decided I want to be able to enjoy an almost straight-liquor drink. I can’t imagine I’d ever be able to do a martini. My favorite go to when the chill hits is a good Port. I’ve had a Vintage Port which is hard for myself to come by, but if you have the time and money (or luck) they are the best. My next go to is a Ruby Port. There’s also Tawny but it’s a little too harsh, although people will tell you it’s the lighter of the two. Of course it comes down to your personal taste. Happy toasting! OK, here’s the question: is port basically a red wine? I ask because, unfortunately, I just don’t like the taste of the reds – too tannic, I think. Now I’m intrigued. Suddenly I have it in my head that Ogre and I should curl up with some port late on Christmas eve.